Looking to seal some cracks in the foundation of my house and in the basement. 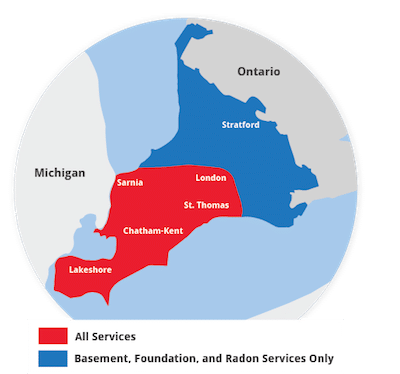 We are looking to have our basement tested for radon. I would like to know what the differences/benefits of your testing procedures vs the kits I could buy online and send to a lab for analysis. Cement slab leaning towards house. Need one side lifted. Slab is 32X80 and open on 2 sides. It's a platform for garbage cans. We have a leak in our basement, water coming in where the floor meets the wall in one section of the basement. We are using a shop vac to try to keep ahead of it at the moment. Foundation crack...water leaking in basement. What are the options for fixing from inside or outside? Cost? Slab of concrete to the front steps has settled about 5-6 inches. Walkway along side of house has settled abit and leans toward the house. Walkway is about 30 feet long. Looking for a quote to have concrete leveled out in these areas. I hope second part of process is handled the same way. so far i am very pleased. thank you. BT. As you can see I am a satisfied customer. I worked in Retail as a Service Mgr/HR for a number of years. Everyone at your company showed a pride in not only what they do but the company. It was refreshing to have these young people taking care of me like they had been doing it for years. Kevin and Joel are two hard workers. They worked in a timely matter and cleaned up very well when they were done. We couldn't be more please! Shawn Bent is a very nice man, we had a little snafu, it was dealt with, no fuss no muss. Very friendly man, nice and personable. If I ever had any other work to be done I would hope that Shawn would be doing the work. I was very impressed with the man. He was training a new worker and I thought that they worked very well together. As you can tell I am very pleased. Thank-you. Everyone who has seen the job once finished was very impressed. Very neat, clean. 5 star company for sure!! Thanks for all of your help. Couldn't have asked for a better company to deal with. Thanks again! We've been happy with the whole process. Now we wait for the first big rainfall and hope that our basement stays dry! Justin and his crew did a great job and considering the mess involved with such a procedure, did a pretty good clean up. They were polite and friendly and accomplished the job in a very reasonable time. Justin was open to questions and explanations. I was very pleased with all aspects of project. From the first phone call to the company to final clean up, I was impressed. Advanced Basements needs to know that there staff are excellent. Keep up the great work. I will recommend your service to others. Joel was efficient fast and proffetional. Great job; nothing negative to be said! Kevin and crew excellent work ethics. "Kevin and Joel are two hard workers. They worked in a..."
"Shawn Bent is a very nice man, we had a little snafu, it..."
"This was honestly the first company that made me feel like..."
Very pleasant and understanding. Quick to respond. We not only adhere to the highest industry standards, we strive to be the industry leader in the home improvement related services we provide. We also use state-of-the-art products and technology which are designed to fix your home. We are the authorized Basement Systems dealer in St Thomas, ON. These homeowners will now enjoy a dry and healthy basement with no concerns about future water intrusion. These homeowners chose Everlast™ Wall Panels: Easy to clean and inorganic, these panels are a much better option than drywall as they do not support the growth of mould or mildew... and they look fantastic. We removed the water damaged basement wall studs, these studs were then replaced with steel studs. We waterproofed the walls where the water entered. Foundation repair. Small leak in basement. Front concrete slab leading to our front step has sunk down. Would like to get quote on filling under step with gravel and raising slab. We have a foundation crack that needs to be injected. Looking for a quote. Just moved in and looking to get it completed asap. Our concrete patio is sloping towards our house. Hi, Looking to get a quote for some leaking in the basement through a cement wall and also to look at some potential foundation issues. Foundation repair. House looks to be shifting. House 120 years old. Our basement has some pretty bad leaking in this recent rain we've gotten. Could you please come out and help me diagnose the problem and come up with a prevention plan.